Our experienced team has been providing quality tree services on the Central Coast since 2002 for home owners, businesses and insurance companies. Central Coast Treeworx uses a wide range of specialised equipment to ensure that your work is carried out promptly, safely and satisfactorily. Central Coast Treeworx is located at Berkeley Vale on the NSW Central Coast. We provide a wide range of specialised tree services for clients from all areas of the Central Coast and Newcastle. 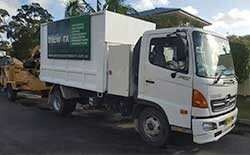 We are fully insured and employ only qualified staff. Our policy is to always provide efficient friendly service, turn up on time and clean up afterwards. It is strongly recommended that when looking to hire someone for tree pruning or removal; you sight proof of their insurance cover and relevant qualifications. The removal or pruning of large trees poses a serious threat of substantial property damage or loss, serious personal injuries or death. Tree pruning or removal should ONLY be carried out by experienced, qualified people who are properly insured and using specialised equipment. We would advise that you contact your local council for their requirements when seeking permission to remove large established trees.